The Relax® Sauna is a personal use sauna with a far infrared ray (FIR) heat source. Quality distinguishes it from any other saunas. It delivers a safe, complete sauna experience from its compact and portable design. Using patented and award winning technology, it achieves positive therapeutic outcomes for a variety of conditions, at a fraction of the cost and effort required from other types of treatment. Listen to a video testimonial below from a man who uses the Relax Sauna, and is founder/president of a functional and integrative medicine practice. Fig. x represents the Relax Saunas' configuration when it is fully assembled. 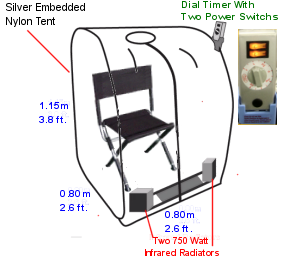 The Relax Sauna can be easily set up, and broken down, in less than five minutes. The Relax Sauna's advantage is its powerful radiators that exclusively emit far infrared radiation (FIR). The main component in the radiator is a ceramic semi conductor that excludes near and middle infrared energy, and actively radiates far infrared light with a wavelength between 4 and 14 microns. Multiple semi conductors in the radiator produce uninterrupted FIR emissions. 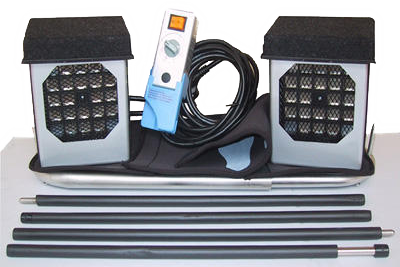 PTC resistors on the radiator's heater assembly enable electricity to flow continuously while the temperature in the sauna chamber is kept between 140° - 170° degrees Fahrenheit. ​FIR energy is not visible to the human eye, but it is detectable as heat. 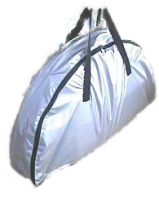 It has been demonstrated in clinical tests that FIR energy rays are highly therapeutic. ​ Human cells absorb far infrared in a range of 8 to 13 microns. Peak absorption occurs at 10 to 11 microns.​ FIR energy resonates with living biomass, optimizes cellular activity, and restores normal body processes that release toxins, and support normal health. There are 20 of these semi-conductors in each of the two 750 watt radiators in the Relax Sauna. ​An electric fan on the back of each radiator cools the heater assemblies, and distributes comfortable heat quickly throughout the sauna's interior . The interior of the sauna tent is a mirror for far infrared rays. 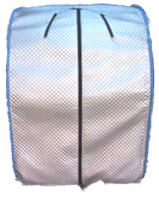 Its silver embedded nylon material prevents heat loss and reflects far infrared light throughout the sauna chamber like a glass mirror would reflect visible light. Clinical research of FIR sauna therapy show significant results. FIR Sauna therapy appears to promote improved blood pressure in persons with hypertension. Significant reductions in systolic blood pressure have been reported from regular 15-30 minute FIR sauna sessions. FIR sauna has been studied for obesity and hypertension. People in the study either exercised for 15 minutes with 30 minutes of FIR sauna or just exercised only three times per week for eight weeks. The subjects in the sauna group lost 1.8 times as much weight and 4.6 times as much body fat as the control group. Body toxicity is at the root of most physical illness. The human body is regularly exposed to air-borne and food-borne contaminants, some of which are not readily expelled from the body. When toxic gases or heavy metal toxins, in the body, encounter a large cluster of water molecules, the molecules encapsulate and trap those contaminants. Over time, as toxic contaminants accumulate, they have a dilatory affect on normal body processes. Circulation is more encumbered, critical cell functions are impaired and biochemical processes become dysfunctional. The consequence of toxic contamination is illness. It is believed that FIR sauna therapy, such as that delivered by the Relax Sauna, is seven times more effective at removing environmental toxins through sweat than are dry heat or steam saunas. Productive sweating is a feature of the Relax Sauna. Its narrow band of pure far infrared energy heats the body from the inside out. Repeated use of the Relax Sauna by people who do not sweat regularly, will gradually restore inactive skins' ability to sweat.